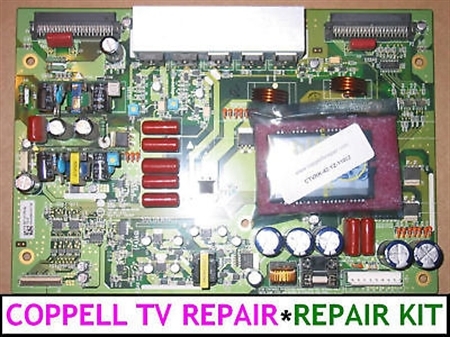 Coppell TV Repair LLC is offerring you a repair kit for a failed hybrid IPM IC 4921QP1041A used in a number of 42'' plasma sustain boards as the one in the picture. Utilizing this kit requires advanced soldering skills and appropriate equipment. A 50W soldering iron for $15 is more likely to damage the board than help do the job! We offer board repair service, but we will reject or at best not give warranty on boards that have been previously worked on. Think twice if you want to DIY or send the board for repair! We do not guarantee that this kit is all that your board needs! Based on solid experience we claim there is about 80% chance this is all you need. 1 in 5 will need additional components and they vary! If you need other components for your service do not hesitate to contact us - if anyone has them we do! The kit contains the same components that our own service technicians use. The IPM hybrid IC in the kit may be different from the one on your board (e.g. Sanyo versus LG), but is guaranteed to substitute it all right. We just buy the ones that work best for us considering both price and quality. Coppell TV Repair specialize in component level service of plasma, LCD and LED TVs and other consumer electroncis. We have serviced hundreds if not thousands of plasma sustain boards. See the reviews for our work and check us out at http://www.coppelltvrepair.com and http://blog.coppelltvrepair.com for some helpful information. Please note we can and will try to support your efforts within some reasonable margins, but we can not troubleshoot your board remotely nor can we spend the time to teach customers on individual basis. If that does not sound right to you or if you doubt the quality of our product, services and advices please do not purchase from us! You will receive parts from the same pool that our technicians on site use. This is the best possible warranty we can give. We will not try and lie we test each individual part. This is practically impossible. So instead we just say look at our feedback, our blog and decide if you can trust our word . We just try to make living by helping customers and charging them fair.